Hello, my name is Amy! 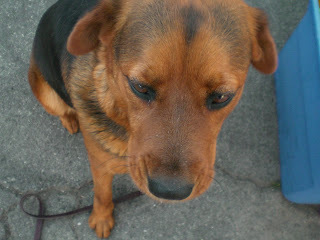 I am 2 year old female Rottweiler mix. I have been here at the Carson shelter since February 3. Susan the dog lady found me in building 1 tonight and then moved me to C247, next to Lucky. 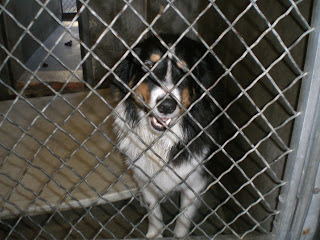 I get anxious when I am neglected but when Susan took me out, I was very calm even walking around the cages. I even touched noses with a few other dogs. 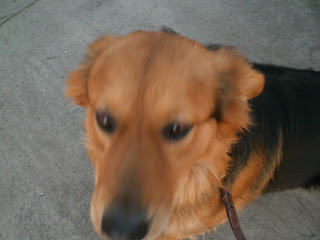 Susan would love to take a dog like me and run me for several miles. I sure could use the exercise. I would love to have a home where I could do that. Won't you take me home? Hi! My name is Lucky. 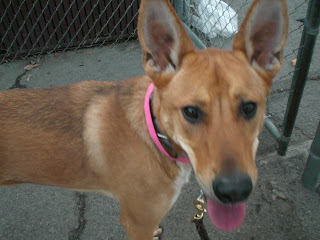 I am 4 year old female shepherd mix, according to my kennel card. Maybe there is a little collie thrown in. Susan the dog lady found me in building 1 and moved me over into C248 tonight. Like Tracy, I enjoyed checking out the laundry room too, and Susan had a hard time getting a good photo of me! Susan walked me around a little. One of the shelter workers asked my name and then said, "Well maybe she'll get lucky!" I am in building 2, in the same area as Roxy, Amy, Peanut Butter, and Tracy. Please come down and say hello to us! My name is Tracy. 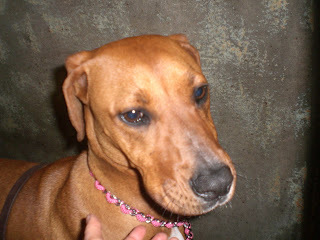 My kennel card says female "shepherd mix" but Susan the dog lady thinks I am part hound, maybe part Rhodesian Ridgeback. Right now I live in cage C219. I am very submissive. I will roll on my back for you and I love it when you give me a good belly rub! I was sooo excited when Susan came to get me out of my cage tonight! I couldn't stop wiggling around and sniffing everything in sight! Susan had one heck of a time trying to take a decent photo of me. In that first photo, Susan just gave me a treat. 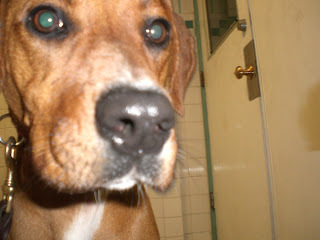 I got to thoroughly sniff out the laundry room while Susan was trying to take a picture of me. At one point she gave up and said, "Let's just go for a walk!" But she got some better pictures of me back at my cage. People here say I am a nice girl. Won't you come on down to the Carson shelter and say hello to me? Hi! My name is Samson. 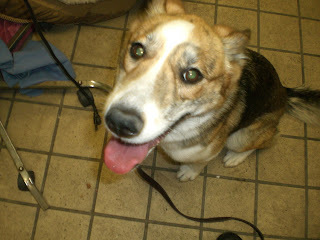 Chuck the shelter aid told Susan the dog lady that I was owner surrendered, and turned in with two other dogs. 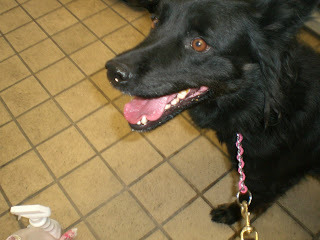 I am a 3 year old male shepherd mix, and right now I am in C247. Somebody wrote on my kennel card that I am not leash trained. So Susan the dog lady, seeing that, thought I was the perfect dog to get to know, and I think she's right! You see, I am a little scared to be here, and this place overwhelms me a little. When Susan tried taking me out on the leash, I sort of freaked out. I would cower and get down a lot. Susan immediately took me out back and tied the leash around her waist, so she could click and treat me for staying close to her. We worked on that for a while, and I got to eat some yummy treats! We did manage to walk around a little. I can't wait until Susan comes back Monday so we can work on this again! My name is Shamus. I just came in on February 22 (yesterday), so I am not quite available for adoption yet, but if my owner does not claim me, I should be available in five business days. 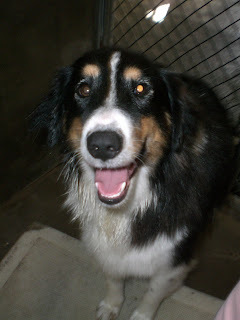 I am a one year old male border collie mix. 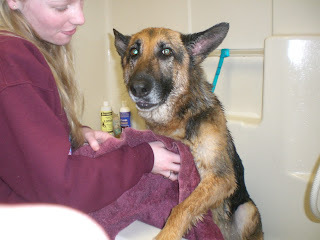 Volunteer Niki bathed me right after Susan bathed Roxy. Susan came by later to see me and get more pictures of me. 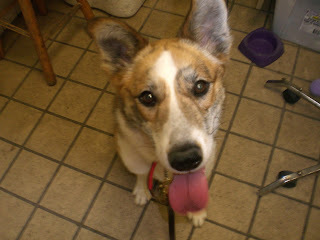 Susan and Niki say that I am a very sweet dog with a very calm disposition. 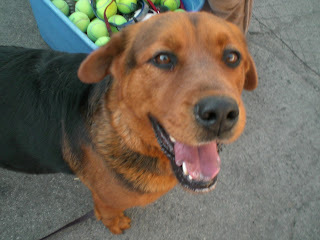 There are lots of great dogs here at the Carson shelter. Did you know the shelter is open on Saturday from 10 AM to 5 PM? Please come on down and visit us! Hi! It's Roxy again. Susan the dog lady misspelled my name the first time, but she's got it right now. I've been here since December 19, and right now I'm in C244. I came in as a stray, and then I think the shelter managed to contact my owner, and I was being held for my owner, but I guess my owner changed his mind. So I am definitely available for adoption, and I'd love to go home with somebody! I was not 1 year old as first marked on my kennel card - I am about 5 years old. The last time Susan was here she furminated me but noticed how dirty my coat felt, so she decided she was going to make a special trip down here to give me a bath! 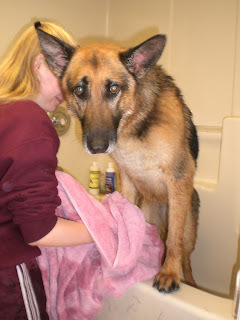 Before she started the bath, she thought she better walk me around a bit to get me a little relaxed. In this first picture, I was waiting while she was actually preparing some food to give me during the bath. A tiny avocado to help make my coat glossier, some Natural Balance lamb and rice formula, and a little kibble. Yum! Susan took the dish and then took me into the laundry/grooming room and started off by furminating me again. It's amazing how much hair came out! 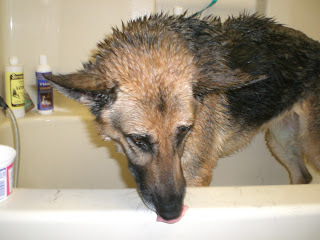 Then she lifted me into the tub and got me soaked down. 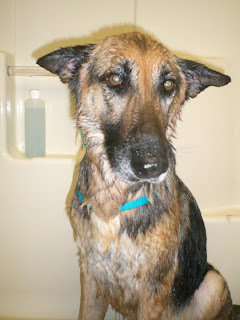 I must have been really dirty because it was very hard getting the shampoo worked up into a lather. Between the first and second shampooings Susan fed me the dish of food. I gobbled it up. Volunteer Niki came by and she started toweling off my head while Susan got the cream rinse. 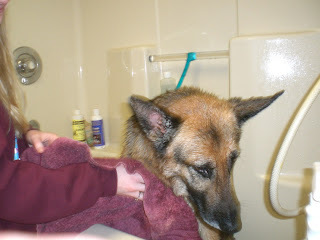 Now Niki is drying me off after the final creme rinse, while Susan is putting down a towel for me to lie on. 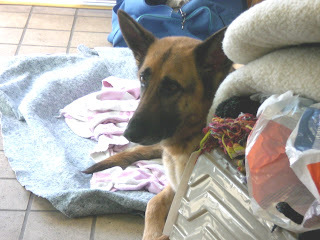 Susan tethered me to a grooming table and let me lie on some blankets while Niki started grooming Shamus. 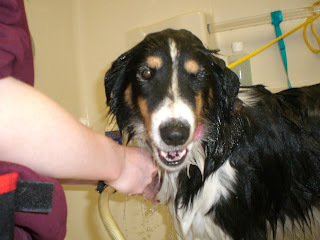 Here I am watching Shamus get a bath! Susan used a blow dryer on me a little to make sure I was dried off. Then she used some ear wipes to try cleaning out my ears. I was quiet lying down on the laundry room floor and Susan kept praising me and giving me her salmon, liver, chicken and vegetable treats! Yum! 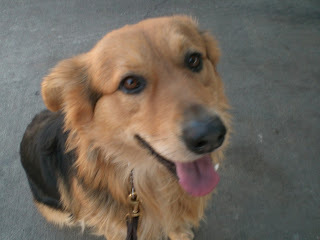 Susan says I am an unbelievably nice dog, with a great temperament! I greeted Shamus the border collie and I can be nice to other dogs. And kids! So please, won't you come down here and visit me, and maybe take me home? 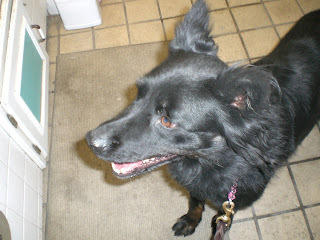 I was just told that that last dog was not Rex, but Mandy, a dog I posted about in September 2006. Mandy and Rex looked so much alike they could have been siblings, though I don't think they were brought in together. The facts are true about Rex, however. 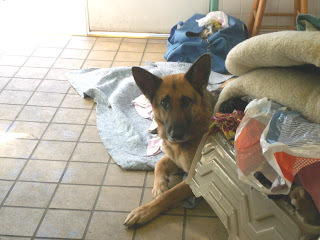 This pedigree commercial was filmed here at the Carson shelter. Rex is the last dog in this commercial, cocking his head. Sadly, Rex remained unadopted and over time became mentally unhinged and started aggressing at some of the staff and volunteers who had been taking care of him. The shelter reluctantly ended up having to put him down. It's very unfortunate, but the reality is that there are too many of us who need homes and not enough people willing or able to adopt us. It certainly doesn't help that condominium homeowner associations put in place strict rules about adopting larger dogs. Yes, my name is Maggie Mae, just like the Rod Stewart song! Of course I am female, though Susan the dog lady doesn't remember exactly how old I am. 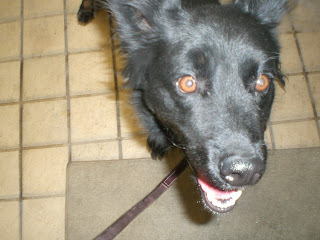 I am some sort of herding collie or shepherd mix. Right now I am in C243. Being in this shelter scares me. Tonight I thought I hit the jackpot when volunteer Evelyn asked Susan to walk me. It was a little difficult getting out of the cage because I was so anxious, but Susan took me in the back, put me on a waist leash, and clicked and treated me for letting the leash be loose and coming to her. 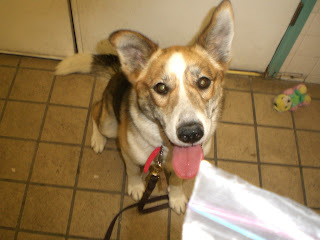 I kept getting chicken, vegetable and salmon treats! That waist leash walking exercise is actually quite relaxing. 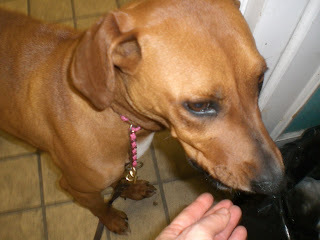 After we do that for a while, Susan then puts the leash back on normally, and we walk around the shelter. 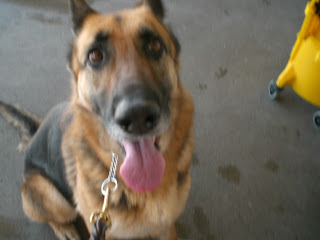 Because I was relaxed from the waist leash exercise, it helped in the walk around the grounds. I really hate it here and would love to have a home! Won't you come down here to the Carson shelter and consider adopting one of us? My name is Peanut Butter. I am Owner Return and I was put in building 1. I have been there since January 29. Susan the dog lady moved me to C218 tonight. I am a female shepherd mix, maybe a year old. Susan put me on the waist leash tonight and walked me around a little in the back, clicking and treating me when I relaxed the leash and came back to her. Those chicken, vegetable and salmon treats were good! I hope we get to do that again next week!